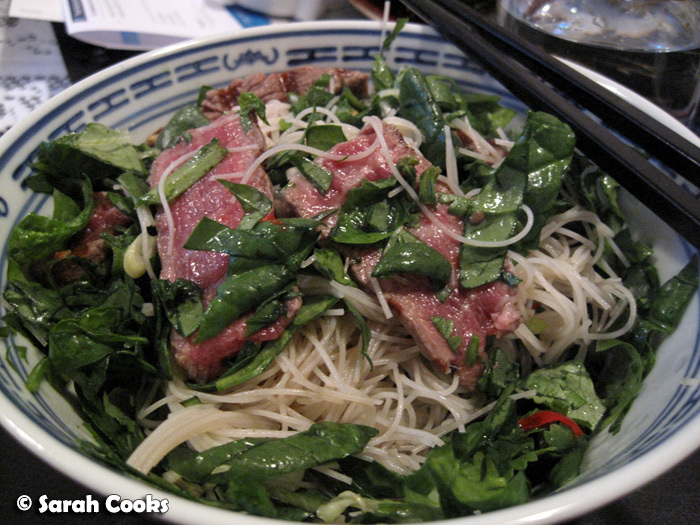 Some tasty, healthy dishes to usher in a new year of eating! 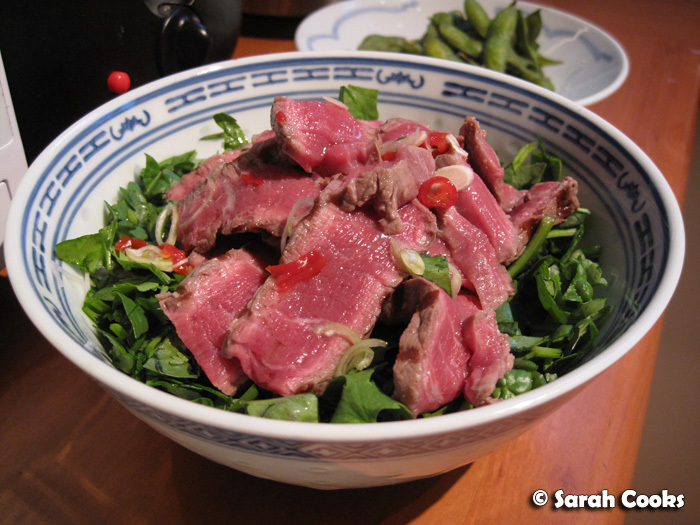 This dinner was a slightly adapted version of Nigella's Cambodian hot and sour beef salad, from the Low Fat chapter of How to Eat. 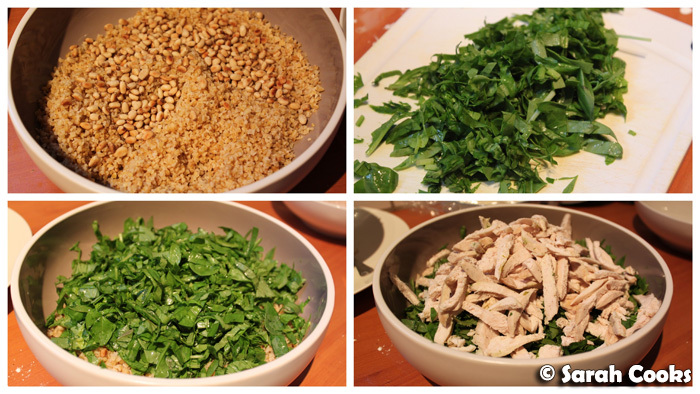 It is the first of her many recipes that follow the "thin slivers of meat strewn across salad leaves" theme. The others include her gingery-hot duck salad (Nigella Bites), cold roast beef with lemon salad (Forever Summer), the Anglo-Asian lamb salad (Nigella Express), and of course, her Christmassy tagliata recipe (Feast). So anyone who thinks that Nigella doesn't have any healthy recipes is really just not looking hard enough! What I like about Nigella's healthy recipes (and yes, I do concede that they are hidden between many puddings, roasts, pies, cakes and butter-laden dishes), is that they taste great and just happen to be healthy, without needing modification for health concerns. But let's get back to the recipe. 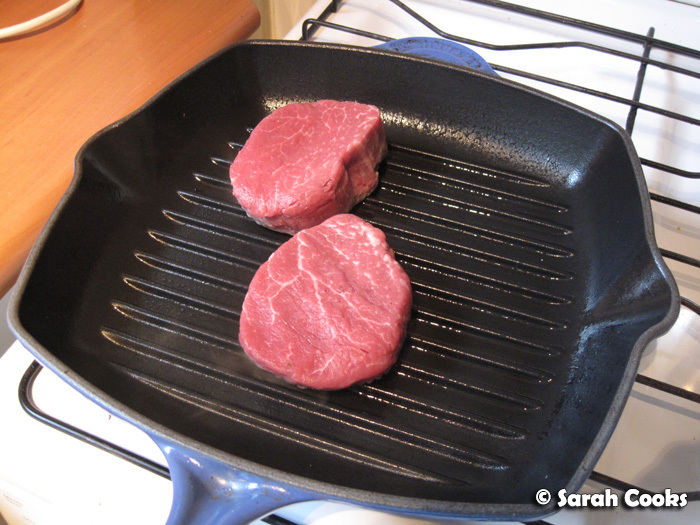 I seared a lovely piece of eye fillet very briefly on both sides, so that it was nice and rare in the middle, and charred on the outside. I ate one in my salad, Sandra had the other with chips and mushroom sauce. I wrapped it up in foil and let it rest while I got on with everything else. 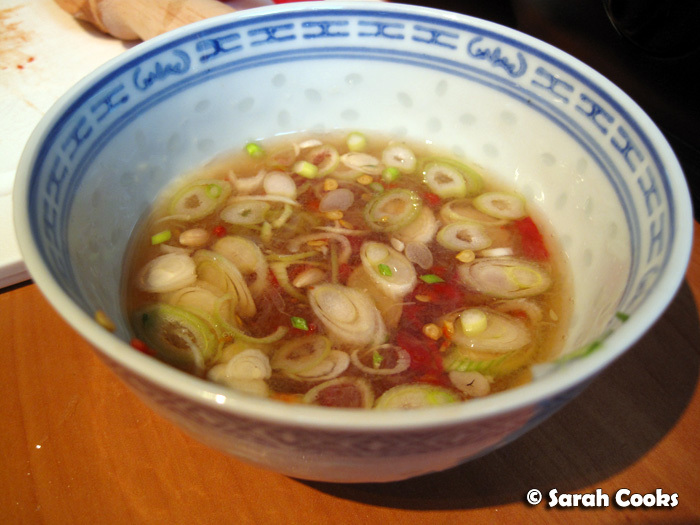 The dressing was a mixture of lime juice, fish sauce, chilli, sugar and spring onions. And now, the adaptation I mentioned - I bulked up the salad with some brown rice vermicelli, making it more a Vietnamese bún than a salad. So, I layered the vermicelli, a huge amount of shredded baby spinach/Thai basil/coriander, and the beef in a bowl, and poured over the dressing. Wow! I last made this salad over 5 years ago, and I'd forgotten just how good it was! I loved the juicily rare beef slices, the refreshing salad leaves and the sharp dressing. It's the type of dish that will fill you up for dinner without leaving you weighed down and bloated. For Christmas, my dad got me Karen Martini's new book, Feasting. I love it! I've made a couple of recipes from it so far, and plan to blog it in more detail soon, but for now I just wanted to share the first dish I made - roast chicken with shredded spinach and yoghurt. I love a good hearty salad, and this is really a meal-in-a-bowl. 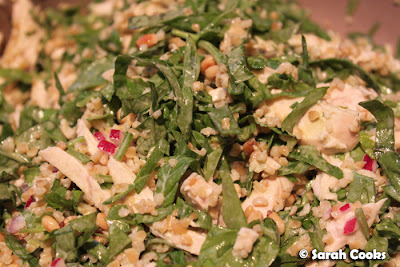 The salad contains spiced bulgur, pine nuts, loads of shredded herbs and baby spinach, and cooked chicken, all tossed through a creamy yoghurt and red onion dressing. I did stray from the recipe slightly, in that I used a mixture of spices (cinnamon, coriander, cumin) instead of the suggested ras-el-hanout, and that I poached my own chicken breasts instead of buying a roast chicken. My local supermarket does sell roast chickens (free range too! ), but they all looked a bit dried out and unappetizing, with wizened little drumsticks. No thanks! 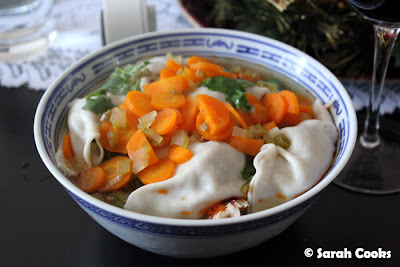 I actually poached the chicken breasts in the chicken stock for the dumpling noodle soup (see below), which added extra flavour and kept them moist. Win! The salad was delicious, and tasted surprisingly rich for having so little fat in it - the Greek yoghurt I used was low fat, and there were only a couple of tablespoons of oil in the whole salad. I had it for work lunches, and it lasted a good 3 days. You may remember the turkey noodle soup that I made with leftover Christmas turkey. (And indeed, why wouldn't you? It was just my last post). It was wonderful, but not very filling, so when I made it again, I made some dumplings too. I love Chinese dumpling noodle soup, but when you get them at restaurants they can be really greasy and MSG-laden. When you make it yourself, however, you can control exactly how much oil, salt and veggies go in, making a healthy little meal all up. 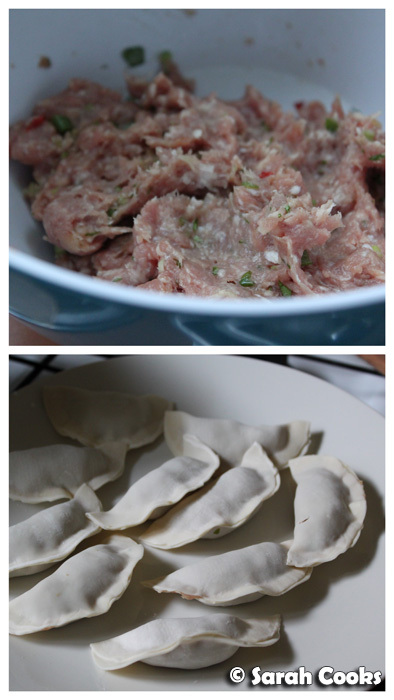 The filling for the dumplings was very simple - just a hastily knocked-together mixture of minced lean pork, sesame oil, pepper, soy sauce, spring onions, coriander, chilli and garlic. I wrapped the filling up in wonton wrappers (my mum says they're good for the complexion), and boiled them in the soup. As you can see, I didn't do any fancy pleating or folding, just pinched the dumplings closed. Looks plain but did the trick! In the bowl were the dumplings, somen noodles, carrots, celery, onion, coriander and spring onions. I served it with loads of Chiu Chow chilli oil, and inhaled the lot in front of the TV. Yum. I don't think we discuss this topic enough, but that's not to say it hasn't been discussed at all. Ed wrote a great post last year about type II diabetes and foodies, and Jon from the now sadly defunct Melbourne Foodie wrote about his (successful, yay!) efforts to lose weight and get healthy (his words, not mine). 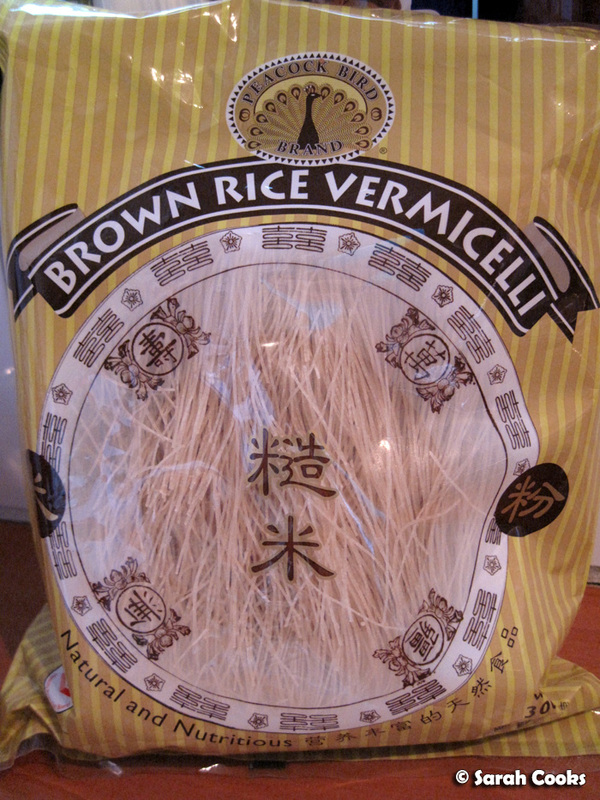 Jackie's post about balancing food with health, "The pork belly (for your gut), Sir?" - You are what you eat", made for good reading too. I have a cousin in his forties who runs for an hour every day so that he can eat what he wants and maintain his weight. A good friend of mine (much younger and also a Penang-ite) eats out for almost every meal, but like my cousin, exercises a lot. As a group, Malaysians don't tend to be the sportiest of people (hah!) but I guess we will always chose food over dieting. What about you? How do you maintain a balance? Do you save your indulgences for celebrations? Or is it an endless parade of pork belly, cupcakes and macarons? I loooove hot and sour salads like your (well, Nigella's) Cambodian one! 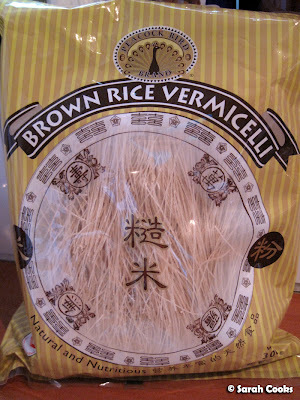 Particularly intrigued by the brown rice vermicelli, too, as I've never seen that before! Great post Sarah! The new year always gets people thinking about their diets and their health, I know it does for me anyway. I'm trying to get a better balance of eating healthier while still indulging my foodie side, but it's difficult sometimes. I think I like the "exercise hard so you can eat hard" approach that your Penang cousins take :). Living in Penang myself, I see people dining out on makan and hiking up Penang Hill in equal measure! I guess everything in moderation...even moderation. Fabulous post - just the thing for all the overindulgence this past holiday season. I just try to eat less sometimes to balance the restaurant meals... and usually my weekday lunches are quite light. Well, that's what I tell myself! I love eating chicken breasts!! 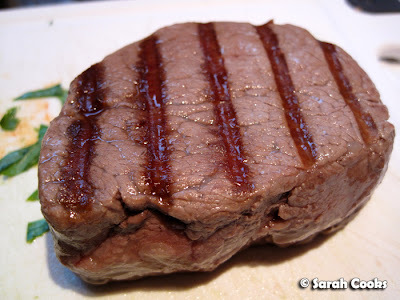 I enjoyed this post Sarah! First of all, I completely agree with you about Nigella Lawson's recipes...some of them really are healthy. So, I usually allow myself a taste, but try to only have a real serving once (or twice) a week. On the days when I eat more sweets or overindulge (which happens) I try to average it out by eating less the next day, or say, eating less for dinner that night. It's definitely a process, and something that takes effort and discipline. Ultimately I do believe that having a healthy diet is more effective than actual exercise. "You are what you eat" really rings true. But hey, everyones gotta enjoy a little now and then! Also, with eating out, I don't really think it's that much of a problem as long as you're careful with what you chose. I often chose vegetarian meals when I eat out, or, I ask the chef to make a few modifications (eg. salad dressing on side, no chips, more veggies etc). Jane B - Thank-you! It is hard to find a balance that works for you, but definitely worth it! Asian people are more likely to kennar diabetes, so gotta watch out! Su-Lin - I do that too... in theory! Lol. It's so easy to slip into bad habits - for me I've gotta work on being more conscious about my eating habits! Michelle - Hehe, that's good! :) Lots of good ways to dress up chicken breasts! Brittany - Thank-you for sharing! You're absolutely right about it being a process. For me, the difficulty isn't dieting itself, but maintaining a balance when I'm "eating normally". I recently noticed that when I'm not dieting, I tend to order the most indulgent thing on the menu, just because I can, not because it's what I feel like. Not good! The difficulty for me is the decision making process. Without a 'diet' to tell you what you can and can't eat, you have to consciously decide whether to indulge or go for a lighter option, taking into account how much exercise you've done, what you've been eating previously etc etc. I'm not sure if I agree with you about a healthy diet being "more effective" than exercise. Although I agree it is definitely possible to control your weight just through controlling food intake, I think you'd need superhuman control to do so. Especially as we get older and our metabolism slows. Having said that, I work in an office and have a rather sedentary lifestyle, so if I didn't exercise at all I'd need to follow a super low-calorie diet to prevent weight gain! I also like the other benefits of exercise - stress relief, muscle tone, relaxation, strength etc. I've suffered from back pain in the past so I'm conscious about keeping my body strong! Good discussion, Sarah! I try not to eat too much indulgent food during the week, and exercise regularly. I do wish I didn't like food so much - ha!